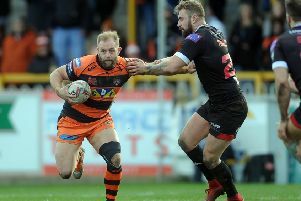 After playing in a Bradford Bulls team struggling against relegation last year Castleford Tigers half-back Luke Gale is relishing the big Super Eights games he is now taking part in. A desire to test himself at the highest level was a big factor in Gale’s move to Castleford at the end of last season and he admits he is really enjoying his rugby with the Tigers. He told the Express: “I’m loving it at Castleford this year. “Daryl Powell, Ryan Sheridan and Danny Orr have helped me work on my game and I’m really enjoying it here. “The lads have been outstanding. “I’ve been enjoying playing with our forward pack. I think it’s brilliant and doesn’t get the recognition it deserves. “They’ve been unbelievable. The likes of Andy Lynch and Grant Millington just take us forward every single week and it’s easy to play off the back of that really. “Coming from a new club I knew it was going to take a bit of time and we had quite a lot of new faces so it took a bit longer than we wanted really, but it’s clicked in now. Gale honestly admitted he did not have his best game against Hull in the first Super Eights game last week. It was his stray pass that led to a try for the visitors to the Mend-A-Hose Jungle early in the second half, although he did more than make amends by scoring a try himself as well as setting up two tries with kicks and slotting over six goals to prove as influential as he has been all season. Gale said: “I had missed a bit of game time and it wasn’t my best game I’ve had this year. “I’m looking to improve on that this Thursday. “It was just the little things you miss. I had a week off after the Warrington game and it’s just the little one per cent in your game that you miss. The skill wasn’t quite there from myself. Gale reflected on how important it was to get the Super Eights off to a winning start against Hull. He added: “It was a real good win. “It was important to kick-off the Super Eights with a win and we had targeted it as a must-win game. “We didn’t start it too well, but we turned it back and ground it out in the second half. “It was a real good comeback. We made hard work of it, but I thought we showed a bit of character. For more from Luke Gale, including his view on that “tackle” by Ben Westwood, see tomorrow’s edition of the Pontefract & Castleford Express.